Siegen is located in western Germany. 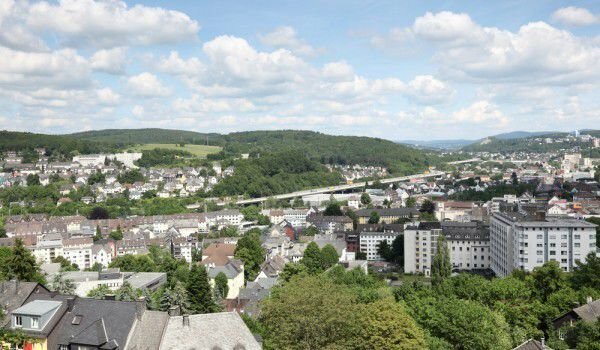 It is situated around the river Sieg, the center of Siegerland - a picturesque area, rich in beautiful hills and valuable minerals. The 100-thousand populated city is one of the educational centers of North Rhine-Westphalia. The city has nearly eight centuries of history. Today we recognize it more like a university town. At the University of Siegen, founded relatively recently - in 1972, annually train more than 14, 000 people. In Siegen you can see the smallest museum in the world, magnificent castles and ancient churches. Although according to official figures, about 80% of the city was demolished during the air attacks during World War II, Siegen quickly managed to recover and revive some of its cultural and historical monuments. Among the most impressive castles in the city is Oberes Schloss, rising to the top of a ridge in Siegen. The palace was built in the 13th century. Today's appearance of the building has not been changed from 16-17 century. It houses a museum of arts and culture. There you can see some of the wonderful creations of the painter Rubens, which is probably the most famous inhabitant of the city. For centuries the castle has served as home to the Nassau family. Therefore, part of their decor and furnishings are well preserved. Besides paintings with pictures of family members in Oberes Schloss, you can see the kitchen and bedroom of the family that lived in the castle several centuries ago. Unteres Schloss or "Lower Palace" is another beautiful castle, which can be examined. It was built in the 17th century in Baroque style. For many years the castle was the residence of local nobility. Today it holds conferences, concerts and other special events. The university had the idea to be moved to the castle, but now it is still not there. The neighborhood Geisweid is the designated by Guinness smallest museum in the world. The museum is located on just 27 square meters. However, in the small space is a rich exposition of music, posters, autographs and other belongings of the legendary British musicians from the Beatles. There are two places worth visiting. One of them is the Museum of Modern Art, which has several unique creations. In the Gallery you can also look at interesting permanent and temporary exhibitions. Attractive center for many local and foreign talents is the Apollo Theater. It was built in 1930 and in 2007, the building was renovated. Martinikirche and Nikolaikirche are the two most impressive churches in Siegen. The distinguishing feature of Nikolaikirche is the high white tower, the top of which is plated. In Siegen is an unusual sight. This is a huge metal structure called "Gasmesser". The city has designated it as a monument. It represents an unusable spherical structure located in the southwest part of town. Local restaurants also create a pleasant atmosphere. There are amazing specials and different varieties of duck cooked there. From Siegen can go to Hagen, located 83 km away, or Frankfurt, which is about 120 miles away. 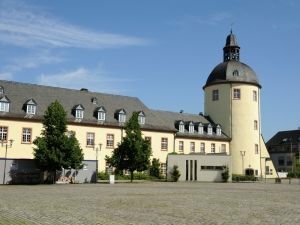 Just a few minutes from Siegen are the ancient towns Hilchenbach and Freudenberg.